Because of their small size critters present very specific technical challenges. If we want to fill the frame with all of the subject or perhaps just an even smaller part of it to reveal fine detail, we need to use special lenses. Compact camera users will normally have to fit a close up lens onto their housing to photograph the really small creatures. Compact system camera and SLR owners usually use special macro lenses and to increase magnification even more may add both tele-converters and/or close up lenses. Macro is a term that is often used to describe close up photography. But the term is regularly used misleadingly. Macro actually means your subject is photographed lifesize or larger. This is also called 1:1. In reality if your subject filled your monitor from corner to corner it is being photographed lifesize and it is a true macro picture. Many compact cameras have a macro feature which enables the built in lens to focus onto a near subject. Some cameras can even focus onto the lens itself. However a small subject will not normally fill the monitor and will appear quite small in the final picture. Many of the kit lenses supplied with CSC and SLR cameras also have a macro feature, but, again, small subjects fail to fill the picture. When the subject does not fill the monitor and picture, it is really close up photography and not true macro. Divers often want to photograph animals that are so small it is hard to see them with the naked eye! 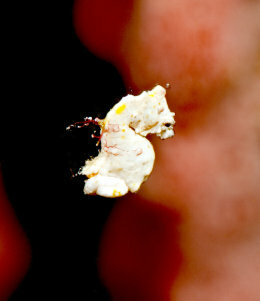 Tiny nudibranchs and pygmy seahorses are examples. To photograph these we need to use a camera that can deliver at least a macro image or, better yet, a super macro image, which means the subject is magnified beyond lifesize. If you are using a compact underwater camera, fitting an INON UCL close up lens greatly increases the magnification of your built in zoom lens. The amount of magnification will depend on which UCL lens you choose and how powerful your built in zoom lens is. Super-zoom cameras with very powerful telephoto settings might seem ideal, but the more you magnify your subject, the harder it becomes to focus. So there are practical limits. Super-zoom cameras can also be very difficult to equip with wide angle lenses. INON’s S100 ZM80 is a special wide angle lens for some super-zoom cameras. If you need more magnification than your compact camera and a single UCL lens can provide, you can combine two UCL lenses. UCL lenses are wet lenses and mount on the outside of your camera housing and can be fitted and removed to suit your photographic opportunities. Users of CSC and SLR cameras can select from several options for critter photography. A specialist macro lens will usually provide lifesize pictures at its closest focusing distance. 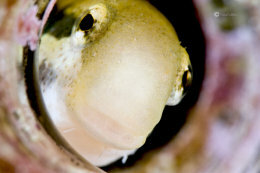 These lenses are also popular for general fish photography with telephoto macro lenses often preferred for photographing smaller fish in clear water. These are normal land lenses and fit inside the camera housing. If the CSC or SLR photographer wants higher magnification he can use a tele-converter mounted between the camera body and the macro lens. This usually increases the magnification by 40 to 100 percent. A popular alternative is to fit an external close up lens, like an INON UCL lens. As with compact cameras, the INON UCL lens can be fitted and removed underwater as needed. Desirable features in a camera for critter photography are manual control of the aperture or F stop. This helps you control depth of field (the amount of your subject which will be in focus) and makes it less likely your light will burn out your subject. Good autofocus is also important. For close up and macro photography focus needs to be highly accurate. A large monitor makes it easier to see your subject and to confirm focus if you prefer to focus manually, which can be more reliable than autofocus. The nature of critters is they often hide out in fissures in rock, sand burrows or in coral recesses. This often means they are found in shadow and you must light them with either a strobe or a video light. Compact cameras usually struggle to light subjects using their own built in flash when shooting in their own macro mode. There is usually a lot of shadow. However if you use an INON UCL lens you may be able to evenly light your subject with only the built in flash depending on the camera and housing combination. A specialist INON UK dealer or INON UK underwater photography instructor is your best source of advice to ensure you get the underwater camera equipment that is right for your needs. This image was taken by INON UK Principal and Underwater Photography Instructor, Lisa Collins, whilst on a shore dive in Cebu, Philippines. The fang blenny had made it's home in the old whisky bottle and would pop it's head out every now and again. Balancing the focus of fast moving fish, with that of the still bottle was difficult, but, after many failed attempts was successful. 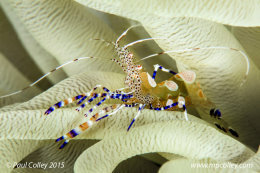 "I photographed this anemone shrimp in Bonaire as a demonstration of different types of contrasts in underwater images, in this case the brittle texture and colourful livery of the shrimp set against the soft feel and drab colour of the anemone. Nikon D4 with a 105mm lens, +5 diopter in a Nauticam housing and 2 x INON Z240 strobes." "I can never get enough of these guys, their rich colouring and texture make them stunning subjects. I am always trying to capture their personalities. One has to be very patient when approaching Porcelain Crabs. I have stacked a +6 macro lens onto of my housed macro lens for greater magnification and to keep the frame as tight as possible. 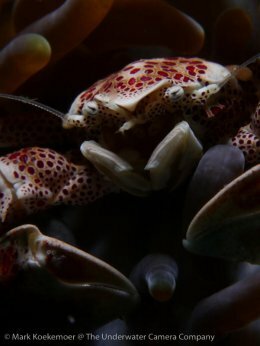 I positioned the strobe with snoot above the crab so that I only light the eyes and colourful carapace, being careful not to illuminate any unwanted matter in the frame. The all important pinchers are visible only by a hint of light creating a silhouette." "Pygmy seahorses are very difficult to photograph normally", says INON UK Underwater Photography Instructor, Lisa Collins. "Because of the nature of their habitat, living in seafans waving in the current, these tiny critters are not only almost impossible to spot, but almost impossible to photograph head on, as they have a tendency to turn their backs to the photographer. Being in the right place at the right time, with an strong element of luck, I managed to not only photography this Coleman's pygmy seahorse in focus, but also whilst it was swimming".